What is the LG 360 CAM? The 360 CAM is LG’s VR-shooting camera, launched ostensibly as a “friend” to the G5 phone alongside its 360 VR headset. But owning a LG phone isn’t a prerequisite, and you could even use the 360 CAM with an iPhone, or indeed on its own – although this isn’t recommended for reasons I’ll explain later. It’s clear that virtual reality is going to be a whole lot bigger than 3D was a few years ago, judging by the media attention and high-profile product releases. 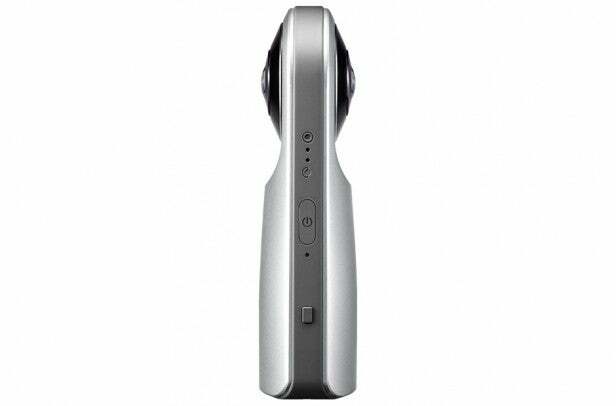 The market is already moving very fast, and as I predicted when I reviewed the Ricoh Theta S, although the latter is a great little product, its reign was likely to be short. The LG 360 CAM could already be its usurper. 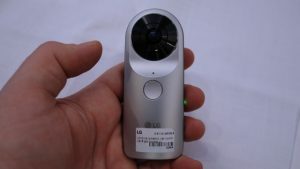 In terms of basic design, the LG 360 CAM is very similar to the Ricoh Theta S. It has two sensors pointing in opposite directions, one on each side, and both are equipped with a fish-eye lens so that together they capture the full spherical 360-degree image. LG doesn’t provide much in the way of details about what is inside. The only info on offer is that its 13-megapixel and 206-degree. Assuming the 13-megapixel figure actually refers to the sensor behind the lens, this is broadly similar in resolution to the Theta S, although there’s no word on the size of the two sensor chips. However, LG beats Ricoh both for top video resolution and top photo resolution – 2,560 x 1,280 for the former at 30 frames per second, and 16 megapixels (5,660 x 2,830) for the latter. So, on paper, the 360 CAM is a mild improvement over the Ricoh Theta S, particularly in the video department. It also avoids one of the slight limitations of the Theta S, in that it doesn’t rely on built-in memory, but instead offers a microSD card slot with support for capacities up to 1TB, which is close to the 2TB specification limit of SDXC. 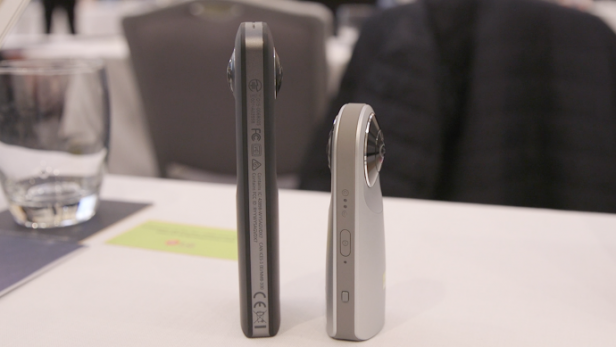 The 360 CAM uses an upright format as is the case in the Theta S, and is broadly similar to a Flip. But with lenses on both sides there’s no built-in display, and there are actually even fewer buttons than the Theta S – just a power button on the edge and a record button beneath one of the lenses. There’s a hard casing included that the camera slips into for protection. With so few buttons, the 360 CAM is virtually impossible to use effectively without a smartphone. But the control app is available for Android 5.0 or iOS 8 or later. The usual Wi-Fi connection is required to connect the camera to the app, but in this case, there’s no button to turn Wi-Fi off and on. Instead, the camera has an always-on Bluetooth connection that you use in the app to turn on Wi-Fi. You can then connect your smartphone to the 360 CAM’s Wi-Fi and return to the app for control. The process is a little convoluted, but the advantage is that Wi-Fi won’t be left on, draining power when you’re not using it. There’s a configurable timeout defaulting to two minutes of non-use, after which the Wi-Fi is disabled automatically. If the camera itself has kept controls to the bare minimum, the app has options aplenty. You can choose which of the two sensors is considered the “front”, and whether both the lenses (for 360) or just one (for 180) is being employed. For a single-lens shot, you can narrow down the angle of view to use the camera more like a regular action camera. In auto mode, there are four scene modes available: night, indoor, landscape and sports. But there’s also a manual option. With this enabled, you can vary white balance between 2,300K and 7,500K. Exposure is configurable from -2 to +2EV, with 25 steps. The ISO can range from 50 to 2700, and shutter from 1/2 to 1/6000, and an auto-exposure level is available that effectively works as a shutter and ISO priority mode. So, while the Theta S is also aimed at usage with the desktop software that can be downloaded from Ricoh’s website, the 360 CAM is intended to be used entirely with your smartphone. However, while you can upload videos and photos directly to Facebook within the app, these won’t be recognised as spherical, as they are with the Theta S – which is a bit of a drawback for share-a-holics. Also, to achieve the promised compatibility with YouTube and Google Street View, you’ll need to download the apps for these for your smartphone. I found that once you’ve transferred content from the 360 CAM to your phone using the smartphone app, both YouTube and Street View apps can then upload directly from the phone’s media gallery. YouTube automatically recognises video as spherical, and Google Street View can be told that the images you’re uploading are spherical. 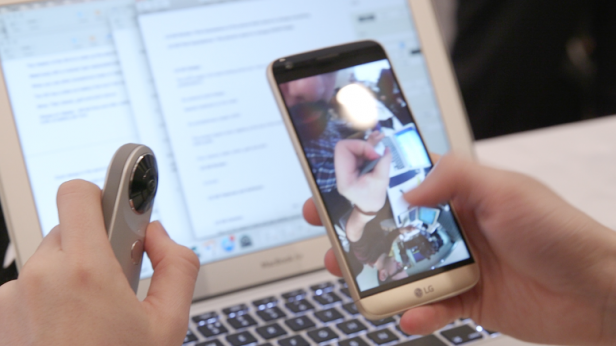 So the LG 360 CAM and a smartphone can enable you to make your video and photos visible online. You can also watch the video and view the photos inside the smartphone app in spherical mode, where angling and rotating the phone will change the point of view. However, unlike the Theta S, you can’t view photos stereoscopically with a viewer such as Google Cardboard, although Street View does support this. A sample of footage shot outdoors can be found here. A sample of footage shot indoors can be found here. Once uploaded to YouTube, image quality is noticeably better than the Theta S. While the latter offers only 1080s video (for instance, a 360 video with 1,080 lines of resolution), the 360 CAM footage will be rendered at 1440s, and the extra detail can definitely be seen. It’s still much fuzzier-looking than Full HD shot with a regular camcorder, though. Spherical video will probably require a 4K or even 8K base file to reach this level. The 360 CAM also has three microphones, so it can record 5.1-channel surround sound alongside the video. However, since YouTube doesn’t support this, and neither does my phone (an iPhone 6 Plus), I couldn’t test whether this was panning with the video – although the video files were definitely being recorded in 5.1 audio. An outdoor photo on Google Street View can be found here. An indoor photo on Google Street View can be found here. There isn’t so much obvious difference in quality between photos taken with the two devices, and Street View doesn’t do the available resolution full justice. The Ricoh Theta S is already relatively better at this than it is at video, and the LG 360 CAM improves quality only marginally. The photos have more detail than the video, while (obviously) being static. Should I buy the LG 360 CAM? The 360 CAM is a promising offering from LG. In particular, it provides better video quality on YouTube than the Ricoh Theta S, which could be enough to convince those who haven’t quite been bowled over by the Ricoh offering that this is the VR camera to buy. On the other hand, the Theta S has a considerable following already – including from developers – and will be offering features such as live VR streaming via YouTube in the near future. The clincher, however, is the price. Where the Theta S will set you back around £300, the LG 360 CAM is closer to £200. Considering that you can pick up 64GB of SDXC memory for less than £20 these days, the lack of on-board memory is more of a benefit than a downside. So while this still isn’t the essential 360 camera that everyone must have, it’s another step in that direction. The post LG 360 CAM appeared first on Trusted Reviews.